Search-and-rescue operations require powerful dive lights with strong beam intensity and sturdy power output. In most cases, these dive lights are used by divers or cavers looking for trapped individuals or in search-and-rescue sports activities. Here are the top 3 search and rescue dive lights that you should know about. This powerful dive light boasts 500 lumens and a USB-rechargeable lithium-ion battery. The powerful battery runs for up to 54 hours and has power modes ranging from high to low intensity. The Light and Motion GoBe Plus 500 Search Dive Light also has a special battery status indicator feature to help you monitor power use and avoid complete shut down. It is waterproof up to 390 feet. Designed with a magnetic mount, a GoPro head strap and easily programmable modes, this search and rescue diving light is one of the best you can get on the market. It is waterproof up to 100 feet and also shockproof. The X-Flare RESCUE LED Multi-Task Light is manufactured with a high-capacity USB-rechargeable battery. This dive light is perfect for signaling and most emergency rescue operations. The top-rated Glo-Toob AAA Waterproof Emergency Dive Light is another powerful search and rescue light that you should consider having. It is waterproof up to 200 feet and has three light modes and a removable lanyard with a quick release clip. This diving light also uses AAA batteries that can last up to 15 hours, especially when used in the low intensity mode. It is a perfect model for diving, camping, action sports and extreme outdoor activities such as cave diving. Hopefully this list of the top 3 search and rescue dive lights will help you get the best diving lamp for your needs. Remember to always check the detailed description of the product features before picking the search/rescue dive light that will perfectly suit your requirements. Scott first experienced the thrill of exploring the ocean while snorkeling during his senior class trip in high school. After that, he threw himself into diving, working diligently to become a master scuba diver so he could achieve his goal of diving for a living. And that’s exactly what he’s done –a commercial diver by day and a PADI diving instructor by night, Scott loves taking his dips after the sun has gone down, and because of this, he’s super particular about the quality and functionality of the dive lights he uses. Welcome to DiveLight! We’re Scott, Dave, and Aaron, and our lives pretty much revolve around diving – what started as a thrilling hobby has turned into our full-time jobs, and we thought we’d throw a blog into the mix to help other diving enthusiasts delve into the surprisingly rich world of dive lights. 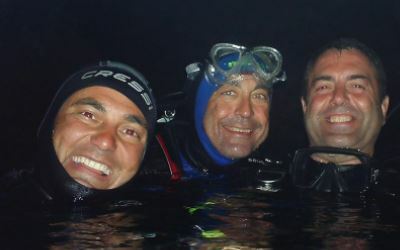 All three of us are certified master scuba divers working as PADI instructors and commercial divers in the United States. In our spare time, we love reviewing the latest and greatest dive lights and giving novice divers and professionals alike tips and tricks for utilizing this fantastic piece of equipment. When we’re not teaching, working, or jumping into the water at night (our favorite time to enjoy some recreational diving), we’re updating the blog. Stick around and stay up to date on the latest dive lights on the market!